GERMANY: Siemens has completed its SylWin1 grid connection in the North Sea, handing it over to transmission operator Tennet. The 864MW network is transmitting power from the Butendiek and DanTysk projects, with the Sandbank site due to join this year. Siemens turbines are powering the three projects, which all have a 288MW capacity. According to WPO Intelligence, the offshore data division of Windpower Monthly, trial operation of the SylWin1 grid link began on 17 December 2014. 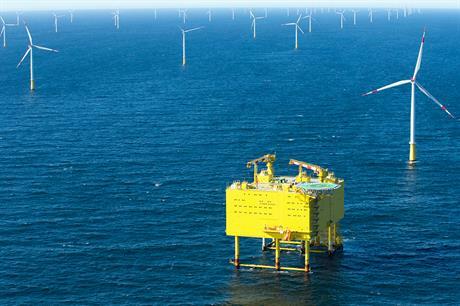 The SylWin platform is located 70 kilometres west from the German island of Sylt. It connects the three projects to an onshore substation at Buttel, northern Germany. It is the third grid connection to be completed by Siemens in 2015. At the end of January, the 800MW BorWin2 connection was handed to Tennet. This was joined in early February by the 576MW HelWin1 transmission. Siemens said the 690MW HelWin2 project should be completed in the "coming weeks".